so from me (and my family) to you and yours - may 2011 be filled with laughter, happiness and love! and i dont mean absent from my blog! (which i am too often!!) but just recently i have stumbled across several gorgeous ezines...how could i have missed them till now!!? insprired ideas - this one i have known about! i am a faithful follower of amy powers inspireco! she has previously published online magazines - but just recently began again...you must go by and have a look-see. if this wont get you in the mood to decorate/craft/just generally get ready for christmas, i dont know what will!! gifted magazine - now this is one of my stumble-upons...and i love it!! filled-to-the-brim with contributor ideas/diy gifts/projects/links...you have to pour yourself a mug full of coffee to get you through this read!! sweet paul definitely has a different feel from the previous two - and is more of a entertaining/recipe filled ezine - filled with yummy pictures and home design projects. 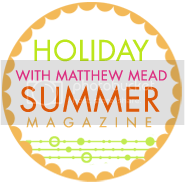 holiday with matthew mead now this next one is not a freebie - and is an hardcopy book-zine that i actually ordered clear back in july - but i think you can still snag a copy if you hurry on over and place an order. i am anxiously waiting by the mail box as it should arrive any day now! so hopefully this will give you a little monday surf-and-click enjoyment!! and hey - what else am i missing out on - please leave me a link in the comments! !